Some cars take a while to grow on you, and some seem great at first but grow progressively disappointing. The Toyota RAV4 was remarkably consistent through our week-long test drive; its strengths and weaknesses are fairly clear. It's an easy car to get to know, with intuitive controls in the places you'd expect, and no big complications or tricks to learn. The engine is surprisingly responsive even at lower rpms, but rather noisy especially as it climbs the revolutions. The four-speed automatic - that's not a typo, it really is four speeds - acts quickly, and is geared well for both city and highway use, though it sometimes seems to be dragging in a lower gear longer than it should, and has a sort of rubbery feel under hard acceleration; being a four-speed, there are also power gaps when going from zero to sixty, but they don't hurt acceleration too badly. 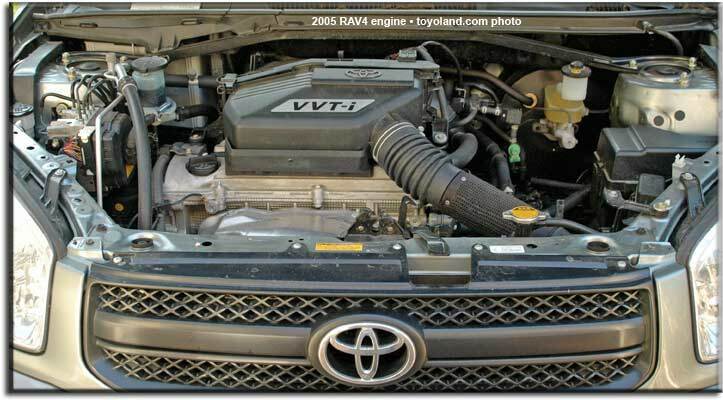 At highway speeds the engine is still strong, with quick downshifting from the transmission when needed. The engine noise is partly drowned out by the wind noise; neither are excessive, but both are clearly present. The engine is a 2.4 liter four-cylinder, but don't let the number of cylinders fool you; it puts out a full 160 horsepower and 165 lb-ft of torque, and it has a good, flat power curve. The same engine is used to good effect in the Scion tC, where a manual transmission brings out its full flavor. 0-60 sprints are done in about 8.7 seconds, which is very good for an automatic-transmission SUV, even a cute-ute; indeed, that's considerably better than the "sporty" Honda Civic EX. The RAV4's interior is nicely styled and designed, with a tan color scheme, but looks up to a decent amount of abuse, with tough (but not too cheap-looking) fabrics and simple functional designs. A full-sized stereo dominates the center stack, providing both a CD player and a cassette, with decent but not great sound; fortunately, the rectangular form factor probably makes it relatively easy to replace if desired (we suspect the speakers would be a better choice). Knobs for both volume and tuning make quick adjustments easy, while individual buttons make switching functions quick. The CD supports text displays. 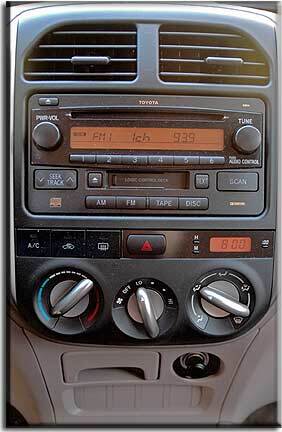 Underneath the stereo is a series of three climate-control buttons, for air conditioning, recirculation, and the rear defroster, a prominent hazard flasher button, and a clock with amber backlighting. The climate control is equally easy to use, with convenient and intuitive controls and an always-relatively-quiet fan. The air conditioner did not seem to affect engine power much; but we also don't know how effective it is, having tested in spring. While small, the instrument panel is attractive, with an unusual three-face design; the speedometer is on the left, the gas and temparature gauges in a round dial on the right (the same size as the speedometer, and incorporating the gear indicator in the middle), and a small tachometer in between with its own round, dull silver bezel. At night, the white-faced gauges have amber numbers which maintain night vision; during the day, black numbers. Twilight and cloudy weather tends to wash out the displays, but they are generally still readable with a little extra effort. Headlights are bright, as usual for Toyota; interior lighting is also good, though you really have to turn the front overhead light on manually for best effect (it doesn't go on when the door opens; only the rear dome light does). An amber circle around the ignition key points the way at night. Door buttons (for the windows and locks), mirror controls, and the dimmer are not lit at night. One area where SUVs have traditionally fallen behind minivans is the cupholder, an invention that quickly became indispensable to coffee lovers and parents. 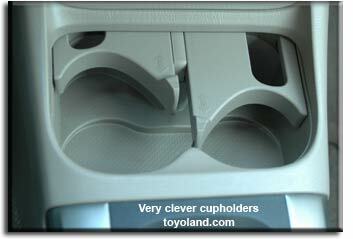 The RAV4 cupholders are among the most clever we've seen, with rounded retainers that pull into place to hold cups snugly. It's a good, simple design that looks as though it'll last the life of the car and prevent a few nasty spills. In back, an oddly designed single cupholder sits behind the front center console; it works well enough and, again, will stand up to some abuse. 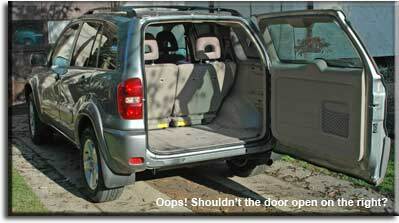 The rear seats in this type of vehicle generally fold and tumble out of the way to make room for cargo, but the RAV4 takes a page from early minivans and has removeable rear seats as well. You can take the seats right out of the vehicle for more storage or better cleaning. That makes the cargo carrying capability more impressive; normally the cargo area is not very large, though it is shaped quite well and can hold a surprising amount of stuff, thanks to the convenient dimensions. Getting the stuff in is fairly easy if you're not pulled up to the curb, since the rear door swings open all the way; but it's hinged incorrectly for the United States, so if you are at the curb, you'll have to go into the street (or hope there's a lot of space behind the vehicle) to load it up. Smaller items can be placed in map pockets in either the front or rear doors, a small opening in the center console, a rather small but deep covered central bin, or, it you take out the owner's manual first, the glove compartment. There's also an overhead bin for garage door openers, complete with a button that mechanically presses the button of your clicker, and a primitive coinholder molded into the center console that has space for a very small number of coins. In the cargo bay, three storage compartments are built into the walls. As for people, the rear seats are comfortable enough, but despite the extra seat belt mounted in the roof, three people probably won't want to occupy the back seats for a long time; and while headroom is quite good, legroom is limited back there. It's fine for occassional ferrying and for younger kids, though particularly long-legged adults may not be able to sit in the front passenger seat while a child seat is mounted in the back. Our experience was that the suspension did not particularly like having full-weight people in the back, anyway. The base price is $21,000 even (plus $565 for destination), which includes the 2.4 liter engine, four-speed automatic, full time four wheel drive, disc antilock brakes all around, 16" wheels, stability control, tire pressure monitor, folding power mirrors, rear wiper, air conditioner with pollen filter, power windows and locks, cruise control, tilt wheel with audio controls, and rear defogger. Overall, then, a very well equipped vehicle at a very reasonable price, especially given Toyota's historically high resale value. Our test car was a bit more expensive; side airbags (both seat-mountain and curtain type to protect all four passengers) added $680, but included, for reasons we don't quite understand, sun visors with illuminated vanity mirrors. The remote entry was $230, roof rack $220, rear "privacy glass" $310, fancy alloy wheels and gray overfenders a whopping $895, mudguards $60, and floor mats $186. We understand the airbag price, but the other options seem a tad on the high side. Overall, the RAV4 is a fun little SUV that really is quite enjoyable and reasonably priced. We don't think we'd try to tackle the Rubicon with it, but off-roading isn't the point (that's for the 4Runner); the all wheel drive is more for dealing with bad weather, snow, and rain, and perhaps going on dirt now and then. The stability control helps to make the RAV4 more fun around town, where it can take surprisingly sharp turns with nary a protest from the tires, and the peppy engine provides just the right amount of go-power to keep it light and fun. The RAV4 is practical enough to be justifiable, while economy is good for an SUV if not exactly commendable by car standards. The overall package is quite nice for SUV buyers, and we fearlessly recommend it.